The house was conceived as a container sitting lightly on the land for habitation or the dream of habitation. The intention was to reinterpret the New Zealand building tradition - the crafting of wood - the expression of structure, cladding, lining and joinery in a raw and unique way. The construction is reminiscent of the "trip" or "rafter" dams common in the Coromandel region at the turn of last century. Heavy vertical structural members supporting horizontal boarding. The unadorned natural timber, a sustainable land renewable resource, provides a connection to nature and the natural. A simple mechanism to the deck allows the "box" to open up on arrival - providing a stage for living - and to close down on departure - providing protection. 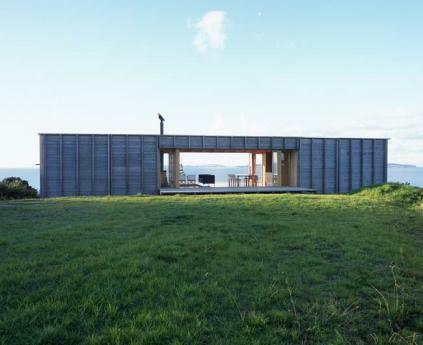 The house has a simple rectangular plan that sits across the contour in a patch of cleared bush in the manner of the rural shed, facing north and the view. The living room is open to the outside and the sun, a metaphorical tent or campsite, while the bunkrooms are enclosed and cool. The large fireplace allows winter occupation and the open bathroom and movable bath allows the rituals of showering and bathing to become an experience connected to nature. This bach is an attempt to provide an environment to capture the essential spirit of the New Zealand holiday in the New Zealand landscape.